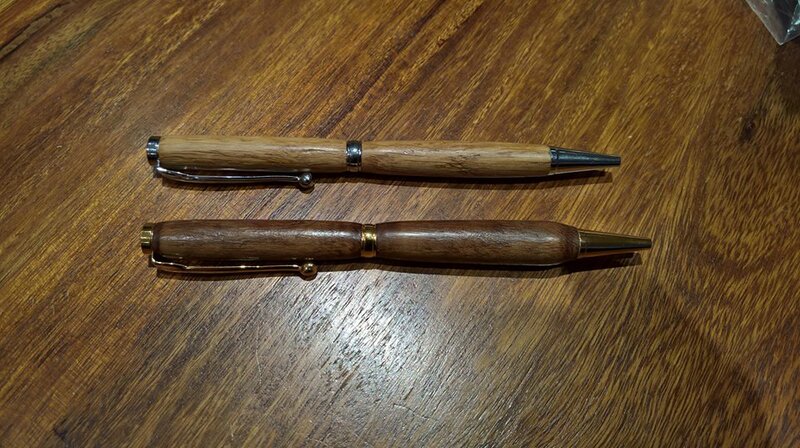 So we are in March 2016 and the time has come to begin a new woodworking related hobby I have chosen wood turning. This section will document my misadventures in wood turning from photos of my first pieces to eventually videos to detail my journey, I am sure I will make many many mistakes but a log of what I am / have been doing should help me get better and if anyone else gets a kick out of my misadventures then all the better. So the first acrylic pen is finished, not too sure if I like them or not, I have a few more blanks so we will see how they go. 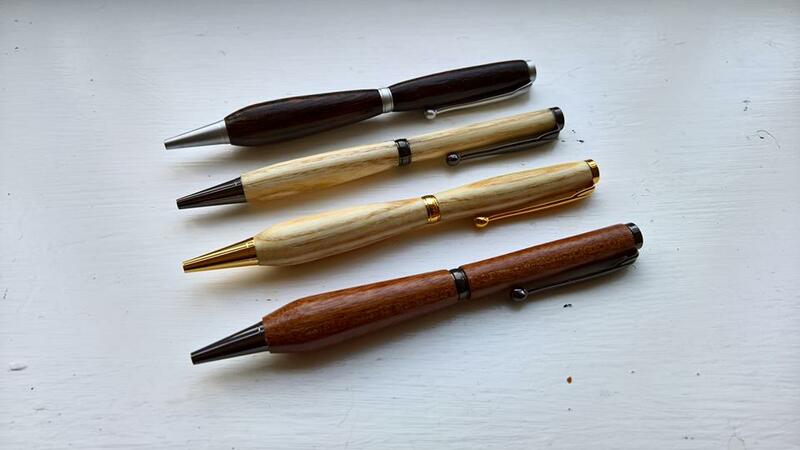 So I have moved on from bowls for a moment and decided to give pens a try and this is my first 6, quite fun little projects and useful as well. I think I will keep at it as there are issues with them but not a bad start. This little bowl is heading up to my grandmothers 90th birthday later in the week. Well this weekend I have been playing with a couple of news items, a blow torch & ebonising spray and the results are below. They are not too bad for a first attempt but I should have built up the ebony layers much slower and a lot thinner. Today’s inspiration has come from both Mike Waldt and Martin Saban-Smith both have fantastic videos to go through and gain some inspiration. So onto project number 6 an Ash Platter, ending up with a 12 inch diameter and a 3 inch depth this Ash platter has Danish oil on the underside and a food safe oil on the top as it is intended as a fruit bowl. Today I have been turning two pots that will be used for makeup pots, the wood is Yew kindly donated to me. The pots are 10cm & 7cm deep the cut from the wooden log in the back of the photo. It looks like two of my turnings have been included in Turner’s Rest. Turner’s Rest is a paper.li content aggregator run my Martin Saban-Smith and it has picked up on two pieces of work that I did last weekend, quite exciting. Pop over to www.turnersrest.com and take a look and subscribe it hits your email inbox on Friday’s. This weekend I have had the pleasure of being taught how to turn some wood. I spent two days with Tom Pockley and have learned so very much that I hope I don’t forget. I guess the best way is to get some more practice in during the week all I need to do is finish work on time so I can play in the garage / wood shop. This is project number 4 a wooden box from cherry wood, it box is 90 mm high with the lid being 50 mm high. This is item project 3 for me and I am quite happy with it, I also turned a box but that will be in the next post. So today was the second item I have turned a small goblet. The lathe with the goblet. So I have taken up a new hobby to go with all of the others, and this is my first attempt to make something. This in an 8 inch sycamore bowl. I am in preparation of a turning course in two weekends time and thought I should give things a go before I went, this is the first thing I have put on a lathe and the first bit of woodwork in over 25 years. This is my attempt, sorry about the quality of the photos I was using the camera on the back of a tablet.